Taking care of the environment certainly comes with its inherent benefits. Cargill recently learnt this the profitable way by witnessing its best financial performance in 2018. The company recently launched its 2018 Annual Report which outlines a year of activating tomorrow’s solutions to nourish the world. Cargill has mapped 2.3 M hectares in their Cocoa supply chain with World Resources Institute to combat deforestation and more than 4,75,000 farmers have benefited this year from Cargill’s training in sustainable agricultural practices. Simultaneously, Cargill’s fortified oils and flour enriched with needed nutrients have now reached 100 M consumers in India. Nearly 30% of raw materials Cargill uses to make aqua feeds come from agricultural, industrial or fishery by-products thereby reducing both waste and pressure on aquatic and marine ecosystems. “Cargill operates today with greater agility and stronger integration to serve our customers’ rapidly changing needs,” writes Chairman and CEO David MacLennan and CFO Marcel Smits in the Annual Report. “In the midst of significant uncertainty in the world, we are strengthening the connections that enable progress. Cargill combines 153 years of experience with new technologies to serve as a trusted partner for food, agriculture, financial and industrial customers in more than 125 countries. 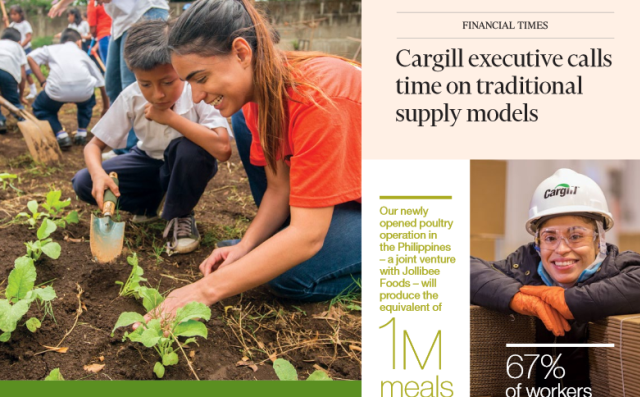 The Annual Report of the Company does not shy away from providing insights into this success of Cargill. It shares the Company’s triple-focused approach of Connect, Nourish and Grow. The Company is connecting the consumer to the producers of food, taking care of the animals and nourishing the under-nourished and growing through capacity buildings of its farmers and stakeholders. The complete Cargill 2018 Annual Report is available as an eCopy on this website and serves as a reader for the sustainable development of food industry.